Rogue Amoeba announced on March 2018 that it would be discontinuing its Nicecast app for Mac, which let users to stream live audio. However, the company is updating its popular audio recording utility Audio Hijack with support for broadcasting. The company says that version 3.5 is focused on internet radio streaming. 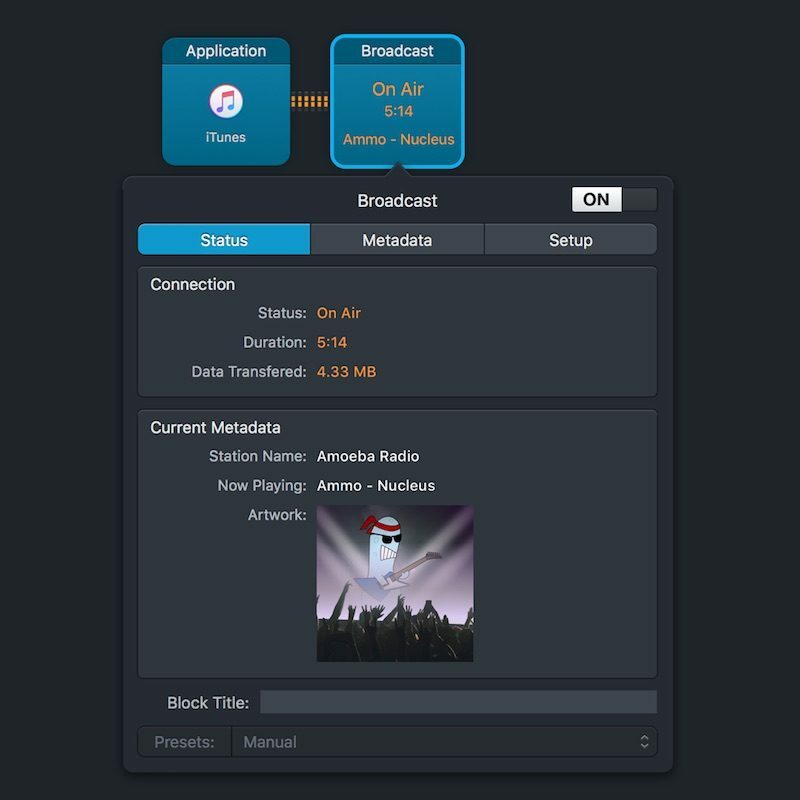 Audio Hijack 3.5 is all about internet radio streaming, with a brand new Broadcast output block that makes it possible to streaming audio to SHOUTcast and Icecast servers. It’s perfect for running live casts of podcast recordings, as well as live streaming DJ sets, and powering all types of internet radio streams. Broadcasting withAudio Hijack version 3.5 is as easy as adding the Broadcast block to your radio chain, making it really easy to send the audio to an MP3 or AAC streaming server. Audio Hijack will support multiple server types such as Shoutcast 2, Shoutcast 1, and Icecast 2 to stream your audio. For those who use AAC for streaming, Audio Hijack will be able to use an adaptive bitrate by using HE-AAC when possible. For traditional internet radio streamers (not podcasters) this update will allow you to automatically send track titles to listeners, letting them know what song is currently playing. Audio Hijack will also have support for multi-broadcasting. Whether you’re streaming one high quality and one low quality broadcast, or broadcasting in multiple audio formats, Audio Hijack has you covered. You can even create presets, making it easy to start every time. Audio Hijack version 3.5 includes a new template for “Internet Radio.” Rogue Amoeba recommends to Nicecast users to switch to Audio Hijack for a more complete and easy broadcasting setup with several advantages. Finally, Audio Hijack will be adding support for a new Input Switch block, which allows broadcasters to easily switch between two inputs. This could be super handy for when you’re testing audio effects or have a prerecorded ad read you’d like to air. Audio Hijack is available for $59 Full Version. If you’re using an older version of Audio Hijack, you can get special upgrade pricing to Audio Hijack 3 for $25. Nicecast users can order Audio Hijack and save $20 off through the end of 2018. Using the Broadcast block requires an external streaming server, set up outside of Audio Hijack. Once you configure Broadcast to send audio out to an external server, listeners will be able to tune in to the stream this server provides. You can purchase a remote streaming server setup at Shoutcheap.com, Shoutcast or Icecast.